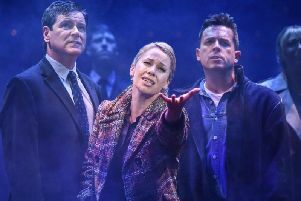 A play that has already dazzled audiences in London and New York, Nick Payne’s Constellations shines just as brightly in this touring production. It’s one of those small-scale theatrical gems – simple in both staging and performance – whose effect burns on in your mind long after the event. Marianne, a cosmologist, and Roland, a beekeeper, are a couple we encounter on their first meeting, first date, first fall-out, and close to their final parting. In that respect it’s a play about life, love and loss. Because Payne and his characters continually re-wind their conversations, until we can almost repeat some of them verbatim. What changes may be the body language, the tone, even the speech pattern or small details. One character begins to lose some power of speech; at another moment the couple re-enact a scene in sign language. Constellations dabbles, just a little, in the science of quantum physics and the theory that we all live in not a universe, but a multiverse, with an infinite number of parallel possibilities . . . and outcomes. The fact that Payne turns all of this into a deeply-humane and engrossing play speaks volumes for his power as a dramatist. As Roland the beekeeper, Joe Armstrong is a grounded tradesman, a hive of almost inactivity compared to Louise Brealey as the effervescent Marianne, with her head above the clouds. More than in other stage or TV performances, Armstrong here strongly resembles his actor father Alun in the quiet ability to convey and contain personal turmoil. Brealey is simply incandescent as a character completely uncontained. Director Michael Longhurst and designer Tom Scutt play it all out against a backdrop of white balloons – that could be empty speech bubbles – which crackle alight as conversations spool back. Time might be irrelevant, as one character asserts here, but this play is worth 75 minutes of anyone’s life.